I was surprised by the advice in this article about recycling plastic bottles. I don’t use a lot of water bottles, but we go through a lot of milk bottles and surely that must be similar. The gist is that when recycling plastic bottles, you should leave the cap on so that caps don’t get sorted by the recycler into landfill-bound waster by the recycler. I’ve had a habit of leaving them on and recently stopped after Melanie asked me about it and I realized that leaving the cap on trapped moisture in the bottle, which can lead to grossness. So now I’ll start leaving it on. However, I’ve always crushed plastic containers when putting them in recycling because an empty milk bottle takes up so much space, which means I have to empty the recycling more often.1 But now they say crushing the containers can confuse the sorting machines into thinking they’re paper and they’ll end up in the wrong place (if your recycling pickup is single stream and not pre-sorted). So, on the plus side I was right about the caps. On the negative side, I guess I’ll be taking out the recycling more often. This is where we are. A couple of guys thought they were saving the world by stealing an endangered African penguin from a South African aquarium and setting him “free”. But what they’ve really done is doomed the penguin, who was born in captivity and has never learned how to fend for himself in the wild, and set back the breeding program designed to save the whole population. The law of unintended consequences strike again. Relying primarily on their emotions and their own sense of self-righteousness, these low information do-gooders have only made things worse. How often do we think that because we have read something online or feel strongly about it, that we’re now experts qualified to talk about it. I see this all the time in the anti-vaccine crowd or the anti-GMO crusaders and the rest, who become so intransigent in their self-imposed partial ignorance that they reject the truth when presented to them. Thanks, guys, for killing the penguin you were trying to save. A fascinating look by FiveThirtyEight at Moore, Oklahoma, and whether it’s really a tornado magnet or whether it’s just had a bad run of luck in the past 20 years, getting hit by more EF4 and EF5 tornadoes than just about any place else. The article is a combination of probability analysis and people’s experiences. Tornadoes fascinate me, as someone who’s never lived near Tornado Alley, because I don’t understand how you can just live with the possibility of a tornado coming through a wiping out everything. One of my college roommates was from central Illinois and he would tel me that he was scared of hurricanes because they’re so big that you can’t really get out of their way. Meanwhile I would say that hurricanes are generally not so powerful that they destroy everything they touch like a tornado does. It’s all what you’re used to, I guess. Two summers ago, a salesman came by the house to pitch installation of solar panels. It was one of those new companies that instead of selling you the panels, leases them to you. You pay a monthly fee that is supposed to be less than your electric bill. In return, they do all the work of installing and maintaining the panels and replacing them. They also make money selling the surplus electricity back to the electrical grid and by getting the tax rebates from the government. It’s not a perfect system. For one thing, some companies don’t disclose all the costs. And some homeowners have been put in a difficult spot when they try to sell their homes because the new owner has to agree to take over the lease and has to qualify on credit. And, by law, they can’t install battery backups so when the sun isn’t shining, at night or during storms, you have to draw from the grid, which also removes another big bonus of solar that when the power lines are down you still have electricity. But overall, it’s a step in the right direction for the “green revolution” and for renewable energy in America. So why aren’t the big electric utilities leasing solar panels and putting them on homes across America themselves? In fact, all of the major players are smallish companies, newcomers to home residential power. Like many mature industries facing disruption from new upstarts, rather than using their vast resources to innovates, instead they hunker down and use external forces—legislation and lawsuits, for example—to maintain control. They’re using their clout with public utility commissions to create extra fees for solar power producers. They also play both sides against the middle, on the one hand pushing the passage of the aforementioned laws that prevent the use of battery backups and then claiming that by lowering their own rates while still relying on the grid at night, the solar companies are raising the costs for the poor and minorities. I love seeing the world through Isabella’s eyes. I try to take a walk each morning and occasionally one of the kids gets up with me and wants to go. This morning it was Isabella’s turn and finally she’s old enough and tall enough that she doesn’t slow me down too much and has the stamina to go as far as I usually do. As we walk, she sees things I don’t see when I’m by myself. I see a lawn overgrown with weeds. 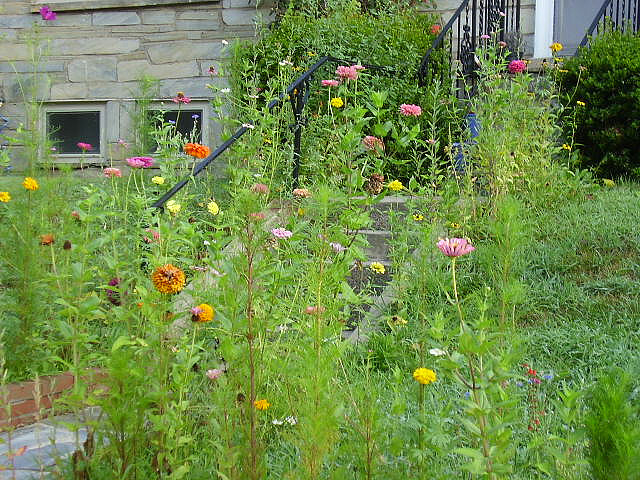 “Oh daddy, the people who live there must be very happy to have their lawn full of flowers,” she says. I see a seedy, rundown house. “What a beautiful light shade of blue that house is,” Bella says. I see an abandoned lot full of trash. “When summer comes this space will be full of flowers. I remember the wild roses from last year,” she says. I see weatherworn garden gnomes. “I can picture how beautiful those statues were when they were new,” she says. For Isabella, the world is bright and fresh and new and full of hope. It’s a place where you see the beauty first and ignore the ugliness. Or where what we define as the ugliness is really just beauty in another form. The Lord sees us as a 7-year-old girl sees the world: Not for the ugliness we see, but for the beauty in what we truly are and can be. Then when skepticism of “global warming” rose in the face of evidence that the world had experienced other cyclical warm periods in pre-industrial times; that in fact the world was just coming out of a period of unusual cooling in the 19th century; that some warming-alarmist climatologists were in fact falsifying their data; and that we were experiencing unusually cold and snowy winters in many places, they changed the term to “human-caused climate change.” The alarmists retorted that “weather isn’t climate” against the obvious evidence of harsher winter storms (never mind that every time a summer heat wave hits we’re treated to cries of “See? Global warming!”). They also said that on average globally and year-round, climate temperatures are on the rise, which causes all storms to become more intense, including winter storms. Thus, they claim, unusually cold and snowy winters are evidence of rising temperatures. However, research using new supercomputer models of global climate since 1871 reveal that in fact, the weather is not getting harsher and more extreme. In fact, the weather, on average, is about the same since 1871 even though atmospheric CO2 has doubled in the past 100 years. That’s right, no one is denying increased so-called “greenhouse gases”. The real question is whether those greenhouse gases actually cause the climate to change in any significant way, and whether other natural causes—such as cyclical changes in Sun activity, for example—are the real drivers of climate change. So what?, some may ask. Shouldn’t we take draconian steps to decrease our carbon emissions just in case? Not so fast. All of the proposals for reducing emissions to the levels that the global warmists demand would have catastrophic effects on our economy and on the lives of billions of people around the world whose carbon emissions are part of their steep climb out of abject poverty. In addition, the global warming mindset—the belief that we’re in a period of higher temperatures all around—is having public policy effects that are already causing drastic problems. Arguably, global warming was a factor in that case. Or at least the idea of global warming was. The London-based Global Warming Policy Foundation charges that British authorities are so committed to the notion that Britain’s future will be warmer that they have failed to plan for winter storms that have hit the country three years running. On the other hand, it is the very prosperity of economically powerful countries that ensure that no matter the weather, lives and property will survive much better. When Cyclone Yasi hit Australia, it was their very prosperity that allowed them to have just one confirmed death from the storm. Compare that to every single cyclone that hits Bangladesh, which is quickly followed by news reports of thousands killed. Likewise, when an unusual ice storm hit Dallas last week, the city was inconvenienced certainly, but its economic prosperity allowed it to continue relatively unscathed. But compare to the dozens who died in Bangladesh and Nepal last winter when temperatures fell to as low as just above freezing. The bottom line is that no one really knows whether the climate is really worse today than at any time in human history; if it is worse, whether it was caused by human activity; and if it is caused by human activity, whether there’s anything we can or should do to reverse it. What we do know is that attempts to flail at the problem have been ineffectual at best, and have done more harm than good at worst. But two lessons rise to the surface here. The first is to never underestimate the power of ecosystems to absorb shocks and adapt to change. While we should not treat Nature with reckless disregard, we should also not dishonor her by intimating that she stands in precarious balance, perennially on the brink of human-caused collapse. As ecology continues to develop as a science, I expect that it will be the extraordinary resilience of natural systems that will become the prevailing acknowledgment. The second lesson is that we must demand a sense of perspective when dealing with issues of environmental concern. The natural inclination when faced with torrents of extremely focused media coverage is to extrapolate broadly to “the ecosystem” at large. Hysteria and fear do not make for good policy, however. An inability to properly understand ecological sensitivity leads to dire predictions which fuel misguided regulatory reaction. This sensible attitude from Paul Schwennesen follows his apt illustration of the so-called “catastrophe” in the Gulf of Mexico. Without letting British Petroleum or the Obama administration off the hook, he shows that dire predictions of ecological collapse are over-wrought and that such over-reaching can lead to bad policy. Picture your neighbor’s pool. Unless you live in Malibu, it’ll contain about 6,000 gallons. That’s the “Gulf” for purposes of discussion. Now go to your garage, get a quart of oil and pour it in when he’s not looking. Pretty good sense of the oil spill in the Gulf of Mexico, right? Nope, not even close. Put a drop of that oil onto a sheet of paper and carefully cut it in half. Now do it again and toss that quarter of a drop into the deep end. Even this quarter droplet (about the size of the comma in this sentence) is about 10% too large, but NOW you have a sense of what 4.9 million barrels of oil in the Gulf looks like.